Human Resources: What kind of person would embrace Cybertronic? Discover the mysterious structure and culture of the Fifth Corporation, and the employees that work within it... both human and machine. Secret Origins: Uncover the secrets of Cybertronic's founding, and the hidden purpose of the corporation. Technology: Explore the sophisticated technology of Cybertronic, which allows their employees to be both more - and less - than human. 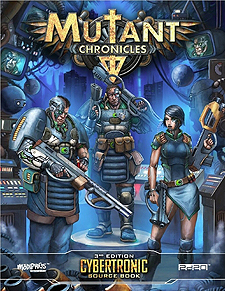 Character Creation: Expanded rules for the backgrounds and professions unique to Cybertronic, as well adoptions for AI and Neoclone characters.